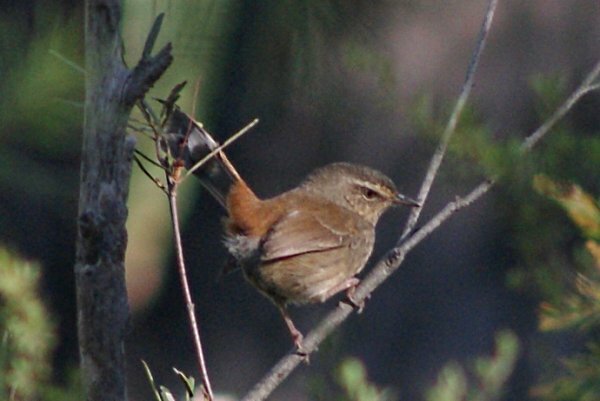 The Chestnut-rumped Heathwren is usually a very secretive and shy bird - add this to their small size (13-16 cm) and they're quite difficult to see, let alone photograph. However, in the breeding season, they can become less shy and will sing from an open perch. 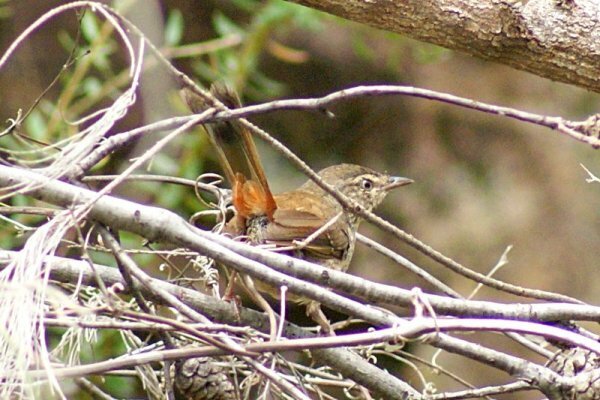 They spend most of their time foraging in shrubs and scrub for insects. As the name suggests, they have a conspicuous chestnut rump and a distinctive undertail pattern. Of all the birds labelled as 'wrens' here, this one probably looks the closest to a true wren (although none of them are related to the old-world wrens). Their numbers are declining, mainly due to habitat loss from development, but also in some areas from bushfires and invasive plant species that change the heaths they live in. 1: Wollemi National Park, NSW, 20/06/2010. 2: Mt Ku-ring-gai Chase NP, NSW, 15/01/2011.